Axosoft is an agile project management tool used by more than 11,000 teams across the world to develop software using Scrum, Kanban, and other hybrid methodologies. Its streamlined UI combined with robust features make it a standout in the world of clunky and simplistic project management tools. Axosoft positions its software as not just a project management solution, but a problem management solution. The team at Axosoft enjoys challenges and spends time building solutions for problems faced in a wide range of industries. Because their own developers use their product, they’re very in tune with the user experience and have created a tool devs actually love to use. With Scrum-style planning and workflow automation, maximizing efficiency is straightforward with this simple, yet powerful platform that helps maximize productivity. Axosoft’s own internal research shows the average team saves 25 percent of their time spent planning and managing project deliverables in any given year — or three whole months. 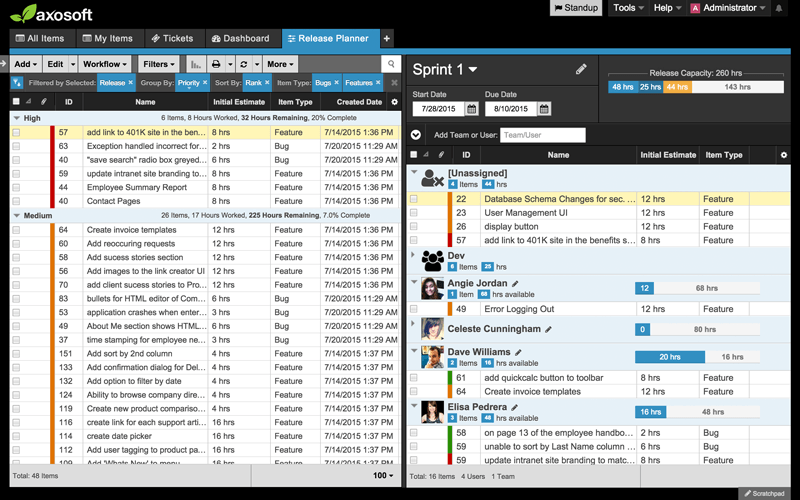 Release Planner: Release and sprint planning lets you see the capacity of each team member and the entire release. You don’t have to worry about under utilizing or overloading your team. Kanban Board: If a visual approach is more comfortable for your team, use the Kanban Card View where you can interact with projects, edit cards and view work-in-progress limits. Daily Standup: Use Standup Mode to organize daily standups effortlessly and visualize important metrics like velocity. There’s even a built-in timer. Help Desk and Portal: Get your support tickets directly in Axosoft as incidents; simply reply in-app with robust email features or turn incidents into bugs or features. Allow an unlimited number of customers and outside stakeholders access to Portal to create and edit tickets—for free! Custom Reporting: Reports are no problem with dashboards that are easily customizable to include sleek burndown charts, velocity calculations, projected ship dates and more. Integrations: Axosoft also integrates with an ever-growing number of services and tools through a developer API. Customer Success: You always have the help of a dedicated Success team from your first implementation session, to ongoing optimizations, and unlimited access to phone support and documentation. Axosoft is a people-first company and extends this philosophy beyond its employees to its customers. Their Customer Success team is accessible to all customers, and product experts configure Axosoft with each prospective customer’s data and specific requirements. This way, you can start to truly see how the software will improve your workflow and processes. Have questions about Axosoft? Want to find out more about Project Management solutions? Call, click, or email to speak with an unbiased Technology Advisor for a no-cost, no-obligation consultation on your unique requirements. Learn everything you need to know about Axosoft. Our experts will reach out to you shortly.